Dr Francine Nichols grew up in multiple provinces across Canada. It was from the experience of working at a small animal practice in King City, ON while she was in high school that inspired her to pursue her career in veterinary medicine. 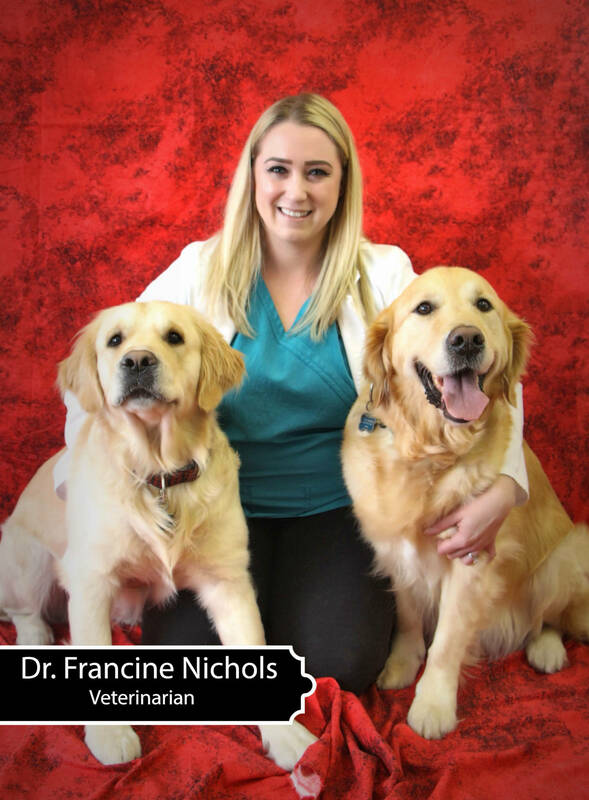 Dr Nichols attended the University of Guelph for her BSc, and graduated from the Ontario Veterinary College in 2010. She worked in New Brunswick, Alberta, and Newfoundland before finally settling down here in the HRM to join our team. Dr Nichols has found that working in a variety of practices has been an invaluable learning experience. It has allowed her to see a variety of cases and develop her skill set on how to best manage them. Dr Nichols enjoys soft tissue surgery, particularly entropion surgery, and cherry eye surgery, but also has a keen interest in internal medicine. In her free time she enjoys yoga, weight lifting, and reading. She also enjoys hiking with her 1 1/2 year old golden retriever, Mowgli, her 7 year old golden retriever, Bojangles, and husband, Matt.